Buying gifts for small granddaughters reminds me that the popularity of Disney’s Frozen (2013) is undiminished. This is a fine thing. It’s a great movie and includes some good role models for little girls. However, there is something faintly disconcerting about seeing children’s clothing emblazoned with the slogan “Let It Go” (title of the lead song from the movie). At these links, you can find the lyrics to the song (by Kristen Anderson-Lopez and Robert Lopez); a video clip of the song as it appears in the movie, sung by Idina Menzel, with the lyrics helpfully added; and a pop version, with a driving rock beat, by Demi Lovato (with slightly different lyrics). It’s a great song. I have both versions on my playlists. The music is powerful, and the lyrics take some clever turns. (It’s the first time I’ve heard the term “fractal” used in a song.) Moreover, the movie visuals that accompany the song are amazing. As an anthem for young girls, “Let It Go” is a very appealing choice. It praises the kinds of qualities we all want to see in young people growing up: asserting your own identity, using your abilities, being unafraid to admit what you are. (“What you are” could represent anything from personal tastes and talents to sexuality—the latter of which is suggested by Elsa’s costume change). The song evokes the “breaking free” trope that’s so appealing to the young—not to mention, now and then, the rest of us—and speaks for self-reliance and independence. So far, so good. We can always benefit from another strong female role model. The trouble is that fixing on “Let It Go” as a rallying cry assumes these attitudes are what we admire in Elsa. But that’s not actually the role the song plays in the story. I assume that by now pretty much everybody has seen this movie, so I won’t issue the customary caution about spoilers—since we now have to discuss specific plot points. Elsa wants to cast aside all association with humanity (“kingdom of isolation”). She has a praiseworthy motive—she feels she has to be alone, so others won’t be harmed—but she also revels in the freedom of isolation. She declares independence, not only from arbitrary constraints, but from moral rules (“No right, no wrong”). Once we’ve seen Elsa’s moment of solitary glory—and it is glorious—the story starts to subvert that declaration. Her isolation leaves her unaware that she’s transformed summer to winter, not just where she is, but also back in Arendelle. 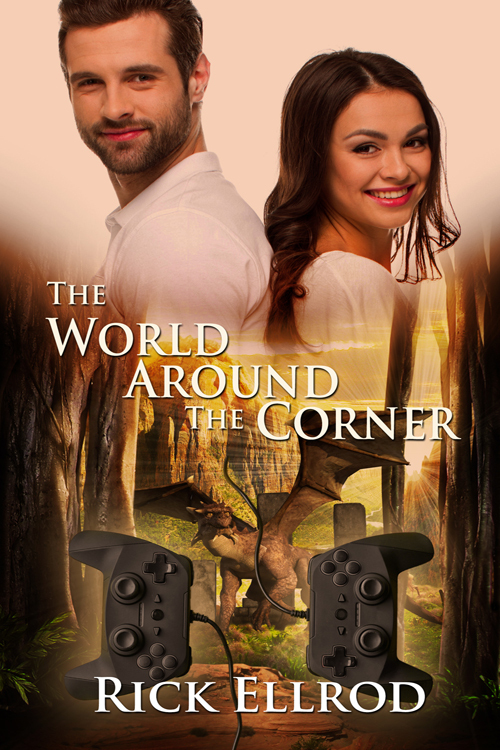 Not until her sister Anna and the skeptical Kristoff struggle up the mountain to find her does she find out how far-reaching the consequences are. To her credit, Elsa is taken aback at these unintended consequences (which are not a consequence of her self-assertion per se, but an incidental side effect). She hasn’t really abandoned all concern for other people. On the other hand, she still doesn’t know how to release this Fimbulwinter. She can’t turn it off. Her only resort is to further distance herself—which endangers Anna and doesn’t solve the problem. Love does enable and empower; but through connection, not disconnection. 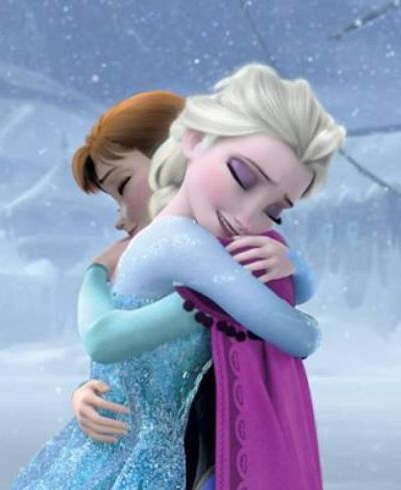 In the end Elsa renounces the very withdrawal she was expressing in “Let It Go.” The disjunction may have been a necessary stage, but eventually it’s replaced by a deeper bond. Which is, after all, just the kind of development that normally faces a child making her way through adolescence to adulthood. 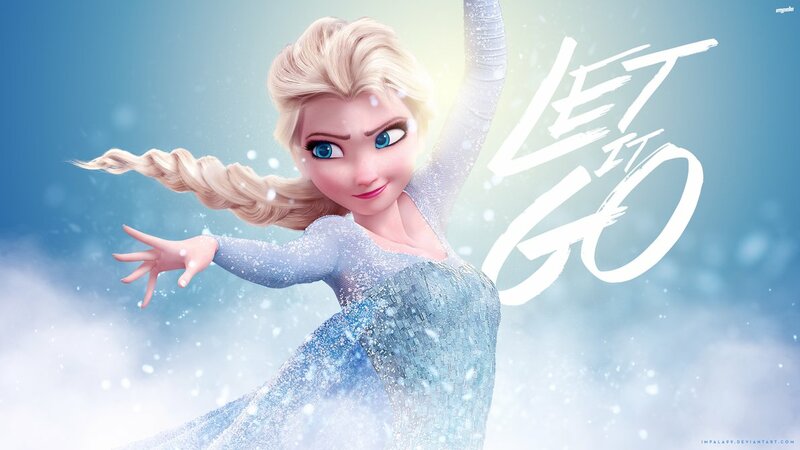 So I have some misgivings about “Let It Go” as an ideal motto for kids. The message of the whole story is broader and deeper than that of the song alone. It’s still a great song, though. What I’d really like is to have it paired with a song that’s as powerful an affirmation as ”Let It Go” is a renunciation. There’s actually a sequel to the movie scheduled for release in 2019. I have no idea what it’ll be about, and such sequels don’t have a good track record for coming out well. But maybe the story will develop in such a way as to give an opportunity for just such an affirmation song. We can always hope so. Our stories are always built on other stories. We draw not only on real life, but on all the other tales, tropes, and archetypes that we’ve encountered. Some of those stories are especially powerful. They express patterns that seem particularly meaningful to us. Tolkien and Lewis called these “myth”—not in the sense of something false, a “lie breathed through silver,” but in the sense of something fundamental. Some mythologies are works of imagination: the Greek or Norse gods, Superman, Star Wars. Some may be built on elements of truth: the fall of Troy, King Arthur. Some may be literally true, though we can select parts of the overall story and express them in imaginative terms—for example, the tales of the American Revolution (Hamilton or 1776,) or what Lewis called the Christian myth (The Prince of Egypt, The Nativity Story). This is true even when we purport to be retelling an existing story. The great tales tend to be open to reshaping. But how far can we go with this sort of adaptation, and still claim to be retelling the original tale? How much stretching and twisting can a given story take before it becomes something else altogether? The best example may be the Arthuriad, the mythology of the Arthurian tales. But that’s so large a subject that it deserves a discussion of its own. A more manageable example is the story of Robin Hood. One thing that helps us feel free to adapt is the lack of a single, “canonical” original version of the story. Any presentation of The Lord of the Rings—the movie, for example—will be judged against Tolkien’s book. But there is no unique original source for Robin Hood. The earliest sources are a variety of medieval ballads, according to Wikipedia’s extensive discussion. When I went in search of a standard version of the Robin Hood tale for my children’s library, there was no single obvious choice. There is an influential Howard Pyle version, The Merry Adventures of Robin Hood—I haven’t read it, but apparently it’s written in an invented antique English idiom that might not be ideally accessible to young people. 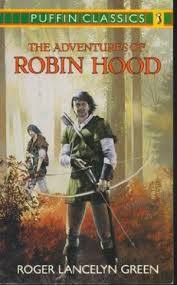 I ended up with Roger Lancelyn Green’s 1956 The Adventures of Robin Hood, which struck me as a good, middle-of-the-road retelling on which to start a young person. There are also political themes. The conflict between underdog Saxons and Norman aristocrats got tossed into the Cauldron in the nineteenth century, according to Wikipedia. More specifically, Robin is often seen as defending the absent Richard the Lionhearted against Prince John’s machinations. And of course one can focus on the economic aspect, robbing from the rich to give to the poor, and make Robin a hero of the 99% against the 1%. The tale generally includes a strong romantic element as well. We can see how these elements can be differently mixed in some of the movie versions, all of which are fairly successful. 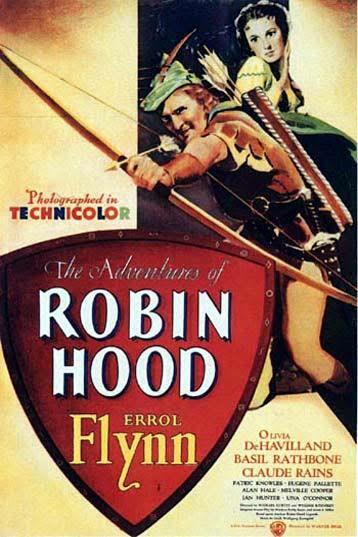 In the Errol Flynn classic The Adventures of Robin Hood (1938), Robin is good-humored and high-spirited. Merriment abounds; the dashing Robin treats much of the action almost frivolously—“Where’s your love of fights, risk, adventure?” He fights with a smile, like John Carter. Marian says: “he’s brave and he’s reckless, and yet he’s gentle and kind.” In keeping with this light touch, much of the soundtrack music has an antic air. Robin is an expert bowman, of course; we see this especially in the tournament/trap sequence (which seems to have been too frivolous to be used in the later movies, below). The plot gives us Saxons versus Normans, with Robin a Saxon nobleman (though he had traditionally been portrayed as a yeoman). In this version, the Sheriff of Nottingham is a fat fool; the villains are Prince John and Guy of Gisborne. Richard is a noble and honorable king, though he has to be reminded of his homeland duties by Robin. His return is protracted, and the politics is internal. Robin (and Marian) speak for one England, not Normans against Saxons, under the one true king. The climactic battle scene is essentially a civil war—John’s supporters against Richard’s. Maid Marian is a pampered Londoner, a royal ward, though she comes over to Robin’s side promptly when he shows her the sufferings of the poor. As usual, there is a competitor for her hand—in this case, Guy. This Marian is not an action heroine. She arranges the plan to save Robin from hanging after his capture, but it’s his men who execute the rescue. The love story is a central thread, and the film ends with Robin and Marian rushing off from the celebration together. 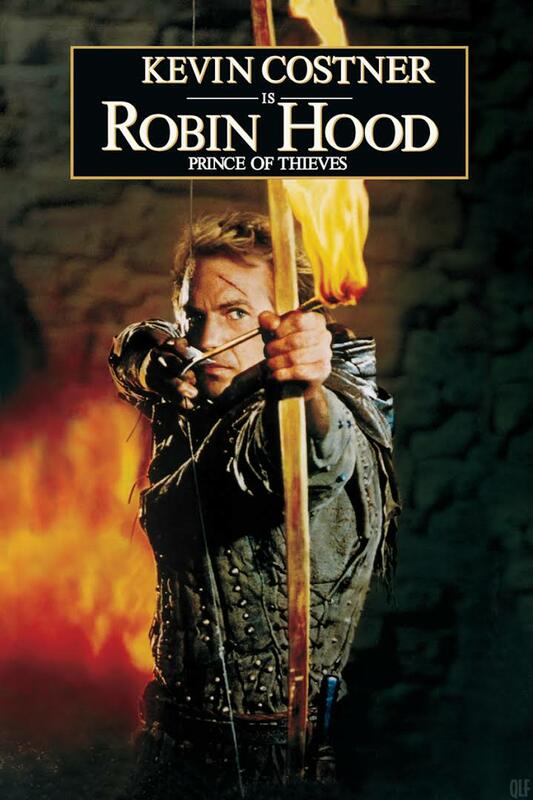 Robin Hood: Prince of Thieves, starring Kevin Costner (1991), presents a more serious treatment. Wikipedia describes it, accurately, as a “romantic action adventure.” The Merry Men angle appears only vestigially, befitting Costner’s somewhat dour screen presence. The Expert Archer trope certainly makes its appearance, as Robin makes progressively more unlikely bowshots to save the day. Prince of Thieves leans heavily on the romance. Marian, a local aristocrat, was acquainted with Robin when they were children—she despised him. She takes a shine to him, however, after Robin returns to find the Sheriff has murdered Robin’s father. Here it is the Sheriff who has designs on Marian’s virtue. The romantic drama rides on Michael Kamen’s epic score for the music—with a main theme so good that Disney has come to use it as the generic musical cue for Disney’s logo. 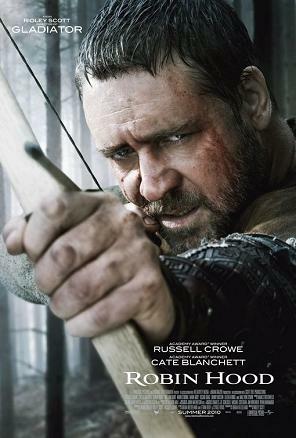 The most recent movie version is called simply Robin Hood, directed in 2010 by Ridley Scott, starring Russell Crowe. This film’s whole atmosphere is more cynical than in either of the two versions described above. For example, where Errol Flynn’s Robin gives King Richard some home truths and is honored for it, Crowe’s Robin gets put in the stocks for giving Richard an honest evaluation, even though Richard specifically asked for honesty. The movie makes a few more nods to actual history, in the relationships of John, Richard, and Walter Marshal—though with a few minor tweaks, such as an imaginary French invasion. (The Wikipedia page lists several criticisms on the history.) Richard is killed near the beginning, in France, rather than returning triumphantly to England. The focus is more on international politics than in the two preceding versions: the big final battle here is against the French. For most of the story, this Robin doesn’t live in the forest. Nor is he precisely an outlaw, though he and his friends do stop one shipment of grain as “men of the hood.” Rather, his central role is as a somewhat anachronistic voice for democracy. Robin’s father Thomas Longstride was a “visionary” who believed in raising up all people; the repeated slogan is “Rise, and rise again, until lambs become lions.” Thomas wrote a charter of rights, signed even by barons. In one of the few nods to the Merry Men, these rights include the right for each man “to be as merry as he can”—a livelier form of “the pursuit of happiness.” There’s a reference to “liberty by law,” as opposed to the despotism of a “strongman” tyrant. Marion too, though she’s a lady, is shown doing mundane chores alongside the farmers (Robin originally mistakes her for a farm girl). In this version, the Sheriff is practically a nonentity. John and the character representing Guy, who has mutated into “Godfrey,” are the villains. Here John is a much more ambiguous character, rising to an almost heroic role at the climax. But he then throws that role away by refusing to sign the Magna Carta—a historically dubious twist—and condemning Robin. The romance element is also strong here, though to some extent it takes a back seat to politics (Wikipedia describes the movie as an “epic historical war film”). Robin finds himself pretending to be the deceased Sir Robert of “Loxley” on his return to England. At the real Robert’s father’s insistence, he steps into Robert’s shoes—including becoming (for public relations purposes) “husband” to Robert’s wife Marion. This puts us somewhere in the region of the “Marriage Before Romance” trope, and allows for some endearing scenes as the two begin to fall for each other. Marion herself is stronger and more assertive here than either of her film predecessors above (harking back to Green’s description of Marian as an “expert fighter,” p. 222). She’s competent with sword and bow work; she frees her villagers; she even joins the final battle, in an Eowyn-style armor disguise. At the same time, she still needs to be rescued occasionally, and is again pursued by unwanted romantic attention from the Sheriff. In place of the usual happy ending, Robin is finally declared an outlaw at the very end—riding off into the sunset, as it were, as a perennial spirit of rebellion. “And so the legend begins,” a title tells us. As noted above, my view is that all of these movie treatments work, despite their varied treatments of Robin’s character, his martial prowess, the political angles, the villains, and the romance. They all seem to be acceptable ways of telling the Robin Hood story. One can appreciate the same tale rendered in a number of different ways, mutually inconsistent in their details, but able to coexist in the viewer’s mind. On the other hand, there are limits to this variability. The Robin Hood subgenre also offers an example of distorting the underlying myth too far — stretching the rubber band till it breaks. 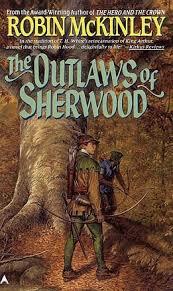 Robin McKinley’s novel The Outlaws of Sherwood tries so hard to avoid the usual tropes that, in my estimation, it fails as a Robin Hood story. McKinley’s Robin is anything but merry—he’s a gloomy, plodding yeoman forest ranger. The Norman-Saxon conflict is active, but Robin has no political awareness at all; he has to be chivvied into revolt by Marian and Much the miller’s son, who handle most of the overall strategy. Adding insult to injury, he can’t hit the broad side of the barn with an arrow. All the fancy shooting is done by others, including Marian. This is a pleasant nod to female action-hero equality, but leaves our image of Robin himself sadly lacking. About the only thing McKinley’s Robin is good at is provisioning a comfortable forest home for his followers and their families. You might say he makes a fine quartermaster, but he’s hardly a leader. The political themes are muted. Guy and the Sheriff are the villains, and larger national or international issues are not prominent. Richard the Lionheart does appear, to receive the main characters’ fealty and thus end their outlawry, though he then takes them to the Crusades as a sort of penance. The Robin-and-Marian romance is integral to the story, but it proceeds in slower and more complex ways than in the movies. Robin is hesitant and tongue-tied, the opposite of the dashing Errol Flynn. Only when Marian is injured, after taking Robin’s place in the famous tournament, does he admit to loving her. McKinley is aware of the way in which authors construct tales in different shapes as they draw their preferred elements from the Cauldron of Story. She notes in an afterword that “[m]any people have strong ideas about who Robin was and what he was like; and a lot of our ideas are as incompatible with each other as they are with history” (p. 277). Her version has its points; but to my mind, it stretches the main themes and tropes too far to be a satisfactory iteration of the Robin Hood legend. We can adapt a myth in any number of ways, but not infinitely many. There are boundaries that must be observed if the story is to remain recognizable at all. A story seems to have an “essence,” and violating that essence makes it into something different. The something different may be valuable in itself; it isn’t necessarily a bad thing to adapt familiar bits from the Cauldron of Story into a new tale. But that—of course—is another story. By now it should be possible to discuss The Force Awakens without issuing a spoiler alert, since everyone in this galaxy has probably seen it. I was tempted to use “Everything old is new again” for the way SW7 harks back to the original movie, but it turns out several commentators have already done that. Then I thought using the phrase “Back to the Future” might express the sense of familiarity the new movie evokes for old-time fans—but it turns out a number of reviews have already done that too (for example, here, here, and here). Somebody’s even done a Star Wars-Back to the Future mashup. The great thing about the Internet is that it’s easy to find out what everyone else is saying. The depressing thing about the Internet is that, when you set out to say something, someone else has probably said it already. Is the familiarity of Episode VII’s tropes a strength or a weakness? Is director J.J. Abrams just rehashing old material, or is he providing us with a charming return to our roots? In this case, I think imitation is the sincerest form of homage. The familiar moves came off well, by and large. Heroes with downtrodden humble beginnings – that’s classic storytelling. Desert planet—Actually, I could have done with a new setting. But the landscape does express the aridity of Rey’s prior life, and it allows for some nice contrasts. (“I didn’t know there was this much green in the whole galaxy.”) And we aren’t there for very long, after all. Invoking family dysfunctions and mysteries also harks back to the original trilogy, of course. The angle that struck me particularly (since I’m old enough to appreciate it) is that “Rey Who?” sparks as feverish a storm of fan speculation as Darth Vader’s Empire Strikes Back bombshell. It’s hard to remember now, when “I am your father” has become a ubiquitous meme, that at the end of ESB we didn’t really know whether Vader was telling the truth. He probably was; it was too good a narrative twist to pass up. But those us who were still attached to the image of Luke’s heroic dad spent three years trying out alternative scenarios. Even more, we debated “There is another.” We canvassed every conceivable answer to that mystery, and some that were inconceivable. Same with Rey’s parentage: I’ve already heard suggestions that are all across the map. At least, on Disney’s more aggressive release schedule, we’ll only have a year and a half to run this issue into the ground, as opposed to three years back in the 1980s. Which is a good thing: by the time Return of the Jedi was released in 1983, we had overthought the matter so much that the actual revelations were almost anticlimactic. By and large, I enjoyed the frequent callouts to Star Wars IV-VI. The new movie combined the nostalgic recognition of familiar themes with the freshness of new characters and relationships. Rey and Finn and Poe play off each other well, but not in the same way as Luke and Leia and Han. Abrams has restarted the story without having to reboot. On the other hand, there were a couple of repetitions that could be dispensed with. The biggest (in every sense) is the Death Star. Er, Starkiller Base. The whole end sequence in SW7 was fun, to be sure. But we’ve seen this scenario twice already in the original trilogy. Three desperate attempts to blow up an Ultimate Weapon is enough. Can we agree, no more Death Stars, no matter how big they are or what fancy names we give them? We need something different for the third trilogy. It’s not as if there aren’t other mythic motifs available. I’ve always felt the third trilogy would work well as a Quest. Let there be something Our Heroes need to find to set a New Republic or new Jedi Order on the right track. We can analyze all these questions to death while we’re waiting for Episode VIII to come out. But if we’ve learned from the 1980s experience, we may prefer just to enjoy the anticipation.